Wishpond has been running social media contests for five years now. Before our marketing suite expanded to include a landing page builder, popup builder, and marketing automation — social media contests were our bread and butter. We’ve been around since the beginning, offering simple solutions to businesses that want to run exciting social media contests to grow their audience and engage their users. From what we see today, a social media contest is still the most effective way to grow your audience fast on social media channels like Facebook, Twitter, and Instagram. An awesome prize and a fun social element, like photo submissions, can go a long way to legitimize your brand. To date, our users have run 31,307 social media contests, and we've learned a lesson or two along the way. I want to share with you the 7 lessons we’ve learned from running 31,307 social media contests. If we could pick one element that really affects the impact of a social media contest it would be the prize. A bundle of items oppose to a single item. It seems that a bundle is deemed higher value (even if it's not, necessarily) than one single item. Plus more variety appeals to a wider audience. Worth the value of the contest entry. A higher barrier to entry would require a more valuable prize so depending on what you’d like to get out of a contest, it should determine your prize. If entrants are required to fill out a long form of questions, submit a photo, and share it on their networks you definitely need to choose something of high value. The prize value should always be equal to the effort required to win it. Tied back to your business. Offering an iPad as a prize if you sell sports equipment is a big no no. It is much better to offer a prize that will bring continued interaction with the business in question. A sports equipment business would benefit more by offering a gift card to the business, tickets to a local game, and some free gear. This way the contest will only attract relevant entries to the business as well as sell product with the gift card. 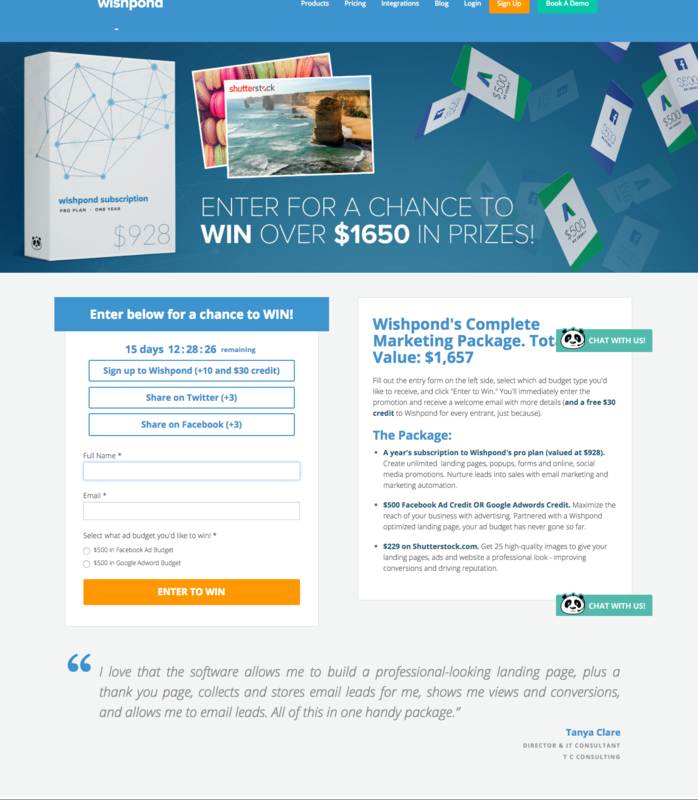 To reach our audience for example, Wishpond has been offering a complete marketing package valued at $1,657. By bundling our prize we can attract our target audience with a range of items as well as offer credit towards our lead generation and marketing tool suite. Need ideas on what prize to giveaway for your social media contest? Check out our article "101 Best Prize Ideas to Give Away in Online Contests & Competitions." Marketers will say this again and again until they’re blue in the face — know your target audience. A marketing initiative will not affect your bottom line unless you know who you’re talking to. Before you begin planning a social media contest decide who you’d like to target with your offer. We’ve seen several contests that have gone astray and attracted many unqualified leads simply because of incorrect targeting. How can I prepare and target the right audience? Begin by understanding where your audience is. Know the websites they visit, which social media channels they favour, what type of media they consume, and, if applicable, where they live. If you are a local business, for example, you’d only want to attract local customers by limiting the areas your advertisements and promotional efforts reach. Let’s say you operate a fitness facility and you’re giving away a bundle of healthy foods and equipment. Aside from promoting it within your facility, reach out to members to share your contest as well as your business partners. Reach out to businesses that cater to your target consumers but avoid business that oppose your healthy values — ie. fast food chains, ice cream shops. The more you know about your audience and their preferences, the higher engagement rates you’ll receive. Running advertisements to a contest is a great way to generate awareness and traffic to it. But it can get pricey. A better way to generate interest is through social sharing incentives. Essentially, have all entrants share the contest with their networks — even more so with a vote contest — in exchange for more votes. Social proof is one of the most effective ways of creating a viral promotion. It’s proven that people are most likely it engage with something if a friend in their network recommends it. After a contest is finished it is essential to have a post-contest strategy prepared. This means having an idea for what to do with the leads you’ve collected. If the leads or followers you’ve gained are just sitting there waiting — you haven’t finished your job. This is why it’s important to know exactly what you’re trying to accomplish with a social media contest. Once the contest has ended we recommend letting your leads know what you’d like them to do next and what to expect. This could mean preparing for the next contest you’re running, signing up for a free trial, or making use of a 10% off coupon valid for a week after the contest. Strike while the iron is hot. Being prepared to engage with your leads immediately after your contest will provide the ROI businesses are looking for after a social media contest. Taking your time to design a spectacular landing page for your contest is a critical part of the conversion process. Where will you host your contest? On your Facebook page? On a separate landing page? What will it look like? Take into account your brand’s look and feel so that the participants can expect a similar experience during your contest. Managing your audience's expectations is crucial to giving your contest legitimacy and credibility. The length of your form, CTA placement, images, headlines, all contribute to decreasing the amount of barriers to entry for your contest. Have a long list of inactive and unsegmented leads? 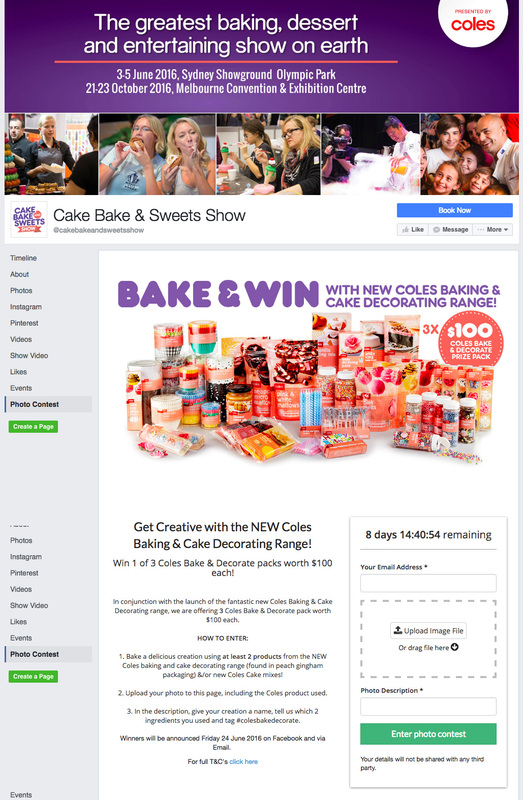 A social contest can be a great way to reactivate and segment a list of leads. By selecting specific prizes for a portion on your audience you’ll be able to separate a segment them for one area of your business. Let’s say you want to create a segment of leads interested in camping equipment. The sporting goods store you own has one of the largest selection of tents and camping supplies, and is always rotating stock with the newest product. By creating a social media contest that offers a tent, gift card, and sleeping bag prize package to your audience you’ll be able to capture a segment that is interested in camping. This way you’ll have an email list that you can hit with emails pertaining to camping products, promotions, and features. MEC (Mountain Equipment Co-op), outdoor gear retailer, hosts a contest that will allow them to segment the cycling enthusiasts in their audience so that they may send them cycling related content. 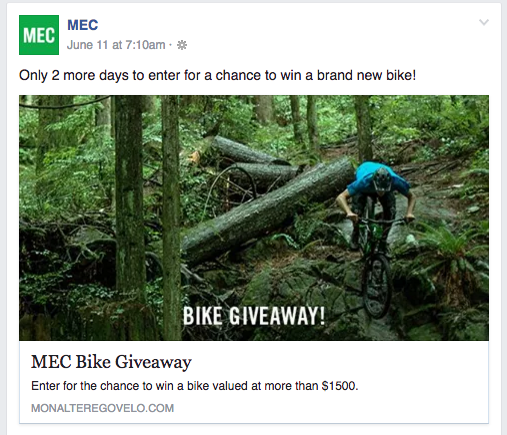 MEC offers it’s audience the chance to win a brand new bike (valued at $1500) on their Facebook. After clicking through to enter, you’re taken to an entry landing page that requires personal information and the completion of a questionnaire about your biking habits. By combining an awesome prize with a questionnaire, MEC is able to learn more about their consumer’s cycling habits and preferences and segment them for future marketing initiatives like an email marketing automation drip campaign. To get a guide to using email alongside your promotion, check out "How to Incorporate Email Marketing and Contests to Maximize Success and Return"
Many businesses overlook the fact that social contests - like a photo contest, hashtag contest, or caption contest - are the most fun and engaging way to grow an audience. This opens the business up to more input from its audience and stronger relationships in the long term. Not to mention that it is the fastest way to build your network of followers instead of paying for costly advertisements. For a brand that really relies on influencers and an audience of ambassadors, a social contest is a great way to engage your community. Compared to a big budget advertising spend, consider running a social media contest to really connect with your audience in a fun and unique way. We've been running social media contests for a while now and we’ve certainly learned a thing or two. We’ve had the opportunity to work with some amazing companies and have given away some really cool prize packages. As social media continues to evolve we have to change the way we use certain tools. Social media contests have been around for a long time but they still remain an effective way to grow an engaged audience quickly. As long as you have your goals in place, an awesome prize, and a post-contest marketing strategy in place you’ll be able to see significant ROI from your efforts. Have you run social media contests in the past? Did you have success? What did you learn from the experience?